Should Government continue to monopolise household savings? A substantial part of household savings should be harnessed for the growth of SMEs, argues, suggesting it is time the domestic non-bank sector got the recognition it deserves and an agency for its development. Only then can savings be channelled to foster SMEs at the local level, paving the way for growth with a human face . The savings rate of our economy, that is Gross Domestic Savings expressed as a perc of Gross Domestic Product, has gone up from 12 per cent in the 1960s to more than 30 per cent in the last few years. More than 70 per cent of this savings is from the household sector, consisting of consuming households and mixed-income households, namely partnership and proprietorship activities. Household sector savings consist of physical savings and financial savings. Savings in the form of financial assets, are in currency, bank deposits, shares and debentures, small savings represented as net claims on the Government by households), life insurance funds and provident and pension funds. There is no generalised social security system in the country. From this point of view, India is the only private market economy in the world, as the role of the state from the point of view of social security is negligible. In this context, individuals have to depend on their own savings and or joint-family support in their old age. Hence, there is a dire need for families to save, especially in the context of increasing life expectancy and decline of the joint-family system. Not only that, the family has to save for the education of their children, children’s marriage, for their health-care needs, especially after retirement, and even, often, for their own funeral expenses, which are part of the samskaras of an average Indian. Hence, households have long-term perspectives and need adequate returns on their savings. Where do the savings of households go? The Government is a large grabber of the savings of households. 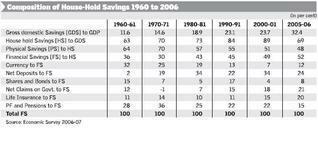 The Table shows the composition of household savings from 1960-61 to 2005-06. Till the 1970s, physical savings constituted the bulk of household savings, but the trend was reversed from the 1980s, since when the role of financial savings increased significantly to reach more than 50 per cent in the current decade. In 2005-2006, the gross domestic savings was of the order of Rs 11,56,809 crore, of which Rs 7,97,117 crore came from the households and nearly Rs 4,16,000 crore was financial savings, of which Rs 3,31,089 crore (80 per cent) was invested in bank deposits, small savings (net claims on government) life insurance funds and provident fund and pension funds, all predominantly government-owned. The Government has been a very inefficient user, providing, on the average, a return not capable of compensating for the inflation rate. In other words, households are earning a negative or marginally positive rate of return, which is supposed to help them in educating their children, taking care of health benefits, old-age expenses, and so on. This grabbing of household savings by the state is an old “socialist” paradigm, which assumes that the state knows best which, in the current context, is highly questionable. For instance, if household savings have been prudently used by community-based, local parent-teacher associations, we would have had better schools and more accountable teachers. The same is the case with hospitals. The uncertainties of the future faced by households is aggravated by the philandering and corrupt state, which furiously taxes the same hapless households. The community is alienated from the state and looks upon it as a nuisance for collecting quarterly taxes and continuous bribes. Instead, if the non-bank financial sector has been encouraged and developed in the financial system, a substantial amount of household savings would have been harnessed for the growth of SMEs in the country. The banking industry has significant limitations in reaching out to the SMEs because of its structure and way of functioning. SME lending is not just lending money but nurturing and developing the entrepreneurial spirit of millions of risk-takers. Each district should have at least two or three non-bank financial entities, which should have had at least Rs 500 crore of assets under management. These entities should foster the development of the SME sector locally, especially in manufacturing and services. The street-side vendor, flower-seller, flour-mill owner, barber, restaurant-owner, bus operator, etc., are credit-starved and, with the arrival of norms (such as Basle-2) from global regulators, the situation is likely to worsen. The larger financial entities are government-owned and the very small ones are getting acquired by global private equity funds in the name of micro-finance and inclusion. But we forget our achievements and our strengths in the area of non-bank funding. The saga of lending to second-hand trucks started in the 1970s by risk-taking entrepreneurs in south India and has provided us appropriate lessons and the proof that India can do it, perhaps better than any Western country. If today, the trucking industry has come of age it is due to these non-banking entities which had the foresight, vision and enormous sense of innovation in financial risk-taking. They know the market, the borrower, the process and have excellent collection mechanisms. Maybe the time has come to remind our planners that the domestic non-bank sector requires recognition and an agency for its development. Only then can the savings of households be channelled for the development of SMEs. And that alone will pave the way for growth with a human face.